How do we rank offenses? Total yards gained? Total points scored? Those numbers aren’t nearly as helpful as we might think. Not all points are created equal. Touchdowns are better than field goals. Some times have more opportunities or better field position than others. We can’t completely eliminate those biases, but we can try. Let’s start today with touchdowns and field goals. How are they related? Do great offenses score more of both, since they make it down the field more? Do worse offenses, stalling in the red zone, turn to field goals as a replacement for touchdowns? Both would make sense, but neither is correct. Look at the graph at right. 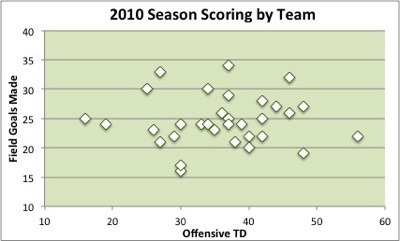 There is simply no correlation, positive or negative, between touchdowns and field goals. And that’s not the only thing we can learn. The difference between the team in 2010 with the most field foals (Oakland) and the team with the least (Buffalo) was 18 — or 3.4 points per game. Having an extra field goal a game sounds like a path to victory, but notice that the Raiders, as league leader, weren’t exactly taking the NFL by storm. On the flip side, the difference between the most offensive touchdowns (New England) and the least (Carolina) was 40 — a whopping 17.5 points per game including extra points. It might seem like a cliche of conventional wisdom, but touchdowns are the difference maker. Everyone’s going to hit about the same number of field goals by the end of the season — teams are within 3.4 points per game of each other there. The key is to get into the end zone. Perhaps not a revolutionary conclusion, but we’ll take this a step further tomorrow. 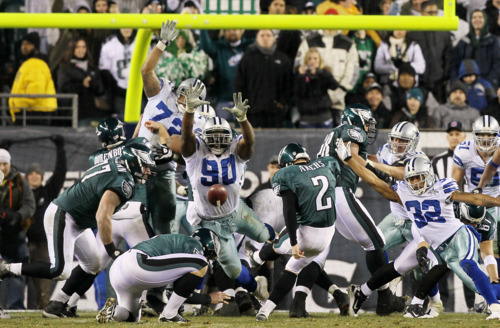 Tagged with Philadelphia Eagles, NFL, Field Goals, Touchdowns, Scoring, Offense, Statistics, Graphs. June 22, 2011 by Brian Solomon.